Shangri-La Asia (69 HK) reported a 15% YoY revenue growth to US$2.5b and 24% EBITDA growth to US$664.5m in FY18, or 109% and 108% of our full-year forecast, which is slightly above our expectation. The gains in revenue were primarily driven by the US$67.2m of carry-over impact from the opening of new hotels in FY17, successful re-opening of Shangri-La Hotel after a major renovation and also a favourable foreign exchange rate from its hotel properties operations. FY18 PATMI was US$192.9m (+22.1% YoY), dragged down by the US$123.2m provision for impairment losses on hotel properties compared to nil in FY17. Its hotel properties segment saw a 9.4% YoY revenue growth, remaining the biggest contributor (~88%) to Shangri-La Asia’s consolidated revenue. The weighted average occupancy was 68% in FY18, relatively stable compared with 67% in FY17, while RevPAR increased by 6% YoY to USD115. Within the segment, revenue from Hong Kong hotel properties was up 18.4% to USD370.1m, driven by a 5% rise in overall overnight visitors to Hong Kong. Its occupancy increased by 7% YoY to 84%, and RevPAR rose 12% to US$249 in FY18. For Mainland China, its performance remained stable with revenue growth of 6% to US$842.1m. Occupancy maintained at 67% while RevPAR was up 4% YoY to US$85 in FY18. The projected opening of Shangri-La Hotel, Zhoushan in Q4FY19 could be another driver for its hotel properties in Mainland China in FY19. With continued signs of demand growth surpassing that of supply growth, we expect that Shangri-La Asia will be able to ride on the growth opportunities in the hotel markets in Tier 1 and Tier 2 cities in Mainland China where 75% of the group’s inventory is located. In addition, we anticipate property sales from Shangri-La’s One Galle Face development in Colombo to continue to contribute to the group’s results in FY19, amounting to approximately US$100m of operating profit. 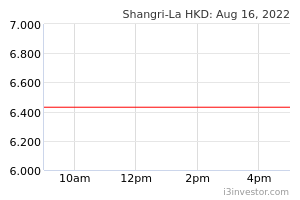 Our fair value estimate for the stock is HK$16.16.